Mac: iOS 8 is here and it comes with a heap of awesome features. One of those features is a new, better version of iCloud dubbed iCloud Drive. But don't enable it yet. iCloud Drive changes iCloud from a clunky, invisible cloud storage system into a more Dropbox-like file system. 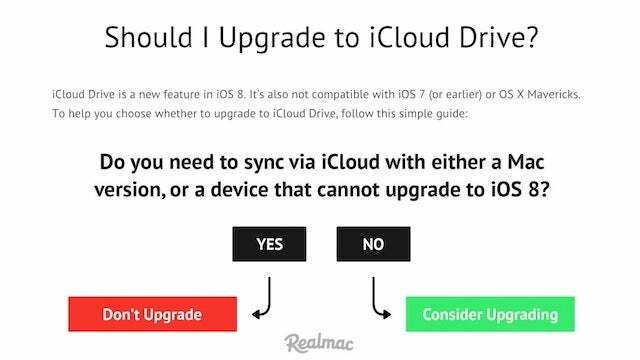 It's great, but iCloud Drive is only compatible with iOS devices running iOS 8 and Macs running OS X Yosemite. If you enable Drive, your apps won't sync up properly until you have Yosemite installed. When you're going through the set up process for iOS 8, you'll see an option to enable iCloud Drive — just chose "Not Now." Once Yosemite is released, you'll be able enable it on both your computer and your iOS device. The folks over at Realmac created a handy flowchart if you're confused. All that said, if you don't own a Mac and don't care about syncing, you can use iCloud Drive right now.